Lake Shore Outdoor Poly Restaurant Furniture. What does your restaurant’s outdoor area look like? Is it four or five tables thrown together with a hodge-podge of chairs? More stressful than serene? With some restaurants, you can tell that their outdoor dining space is not a priority. Maybe customers just prefer to eat inside with the air conditioning on hot days? Or maybe they’re losing business because the curb appeal isn’t there. Depending on your location, your patio could be the first thing a customer sees when they pass your establishment, so it’s crucial to make a good first impression. A simple to way to upgrade your patio without a shred of mulch or concrete, the Lake Shore Collection brings sophistication to your outdoor area, no matter the size! This collection is functional, on trend, and durable; it truly has it all. Combining a clean-cut silhouette with classic Adirondack design elements, the Lake Shore Collection is sure to be a favorite among guests. The bar stools and chairs of this collection feature a waterfall seat, encouraging them to sit back and relax. 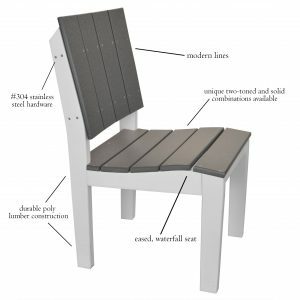 The Lake Shore Collection also features tables, benches, and Adirondack chairs to give your patio a synchronized look. 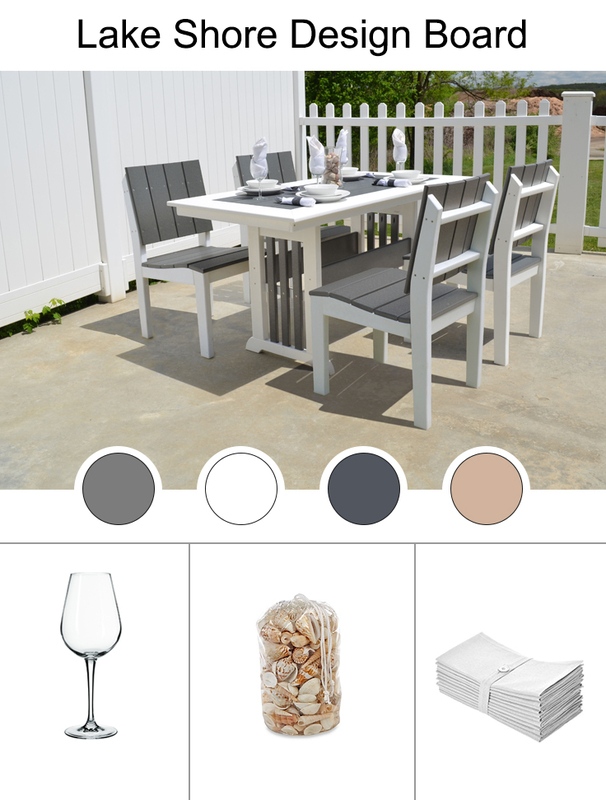 The Lake Shore Collection comes in any combination of our poly color palette to match whatever design you’re going for on your restaurant’s patio. The choices are truly endless with 21 traditional and three wood grain poly options. Whether you want a two-toned set to make a statement with your outdoor furniture or a monochromatic look, the Lake Shore is full of possibilities. Regardless of your area, the Lake Shore is built to last in your environment with its durable poly lumber construction. This can save time for you and your staff. There’s no extra staining or waterproofing because poly does not splinter, crack, or peel like real wood. If you’re on the coast or in an area where storms are prevalent, outdoor furniture can be difficult to maintain, and in some cases, keep track of. The Lake Shore will not blow away in high winds and is resistant to salt spray, making it perfect for boardwalk restaurants or hotels. Whether you’re looking to breathe new life into your restaurant’s patio or you’re furnishing it from the start, the Lake Shore Collection can completely change the vibe of your outdoor space and improve your curb appeal. For more information on how to transform your backyard space with the Lake Shore Collection, find it here or call our customer care representatives at 1-800-986-5352. Turn up your inspiration with our Lake Shore Collection design board below! Follow us on Pinterest for more resources like this one.